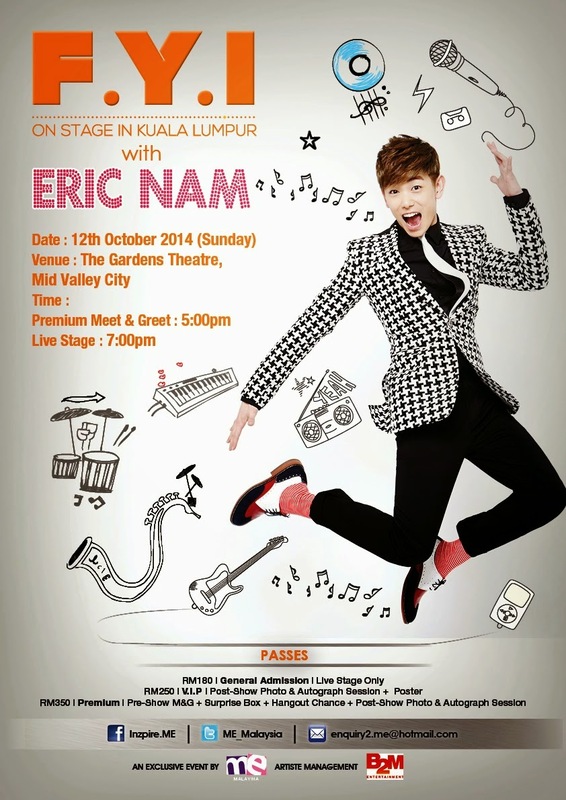 Kuala Lumpur - Korean music fans will have the opportunity to see the talented and charming solo singer Eric Nam in an intimate setting when the artiste takes the stage at Kuala Lumpur on 12th October 2014 under "F.Y.I. On Stage", a series of events which introduces and highlight talented undiscovered artists. F.Y.I On Stage originally schedules to take place at The Garden's Theatre, Mid Valley City has been relocated to Chatime Galleria, Puchong. The date and show time, 12th October 2014 at 7.00PM, will remain the same. Previously purchased passes will be honored at the new venue. V.I.P Passes to the event is still available at RM250 in limited quantity. The passes entitled you to a photo session with the artiste. "F.Y.I On Stage with Eric Nam" promises a cosy, intimate show with a smaller but exclusive crowd. The event setup allows the artist to interact closely with the fans and to go beyond normal performances that Korean music fans are used to. As prelude to the show, Eric Nam will be having a public fanmeeting at Klang Parade on Saturday, 11th October 2014 at 7.30PM. Admission is free and there will be official Eric Nam merchandise on-site. For more information on Eric Nam activities in Malaysia and how to secure your passes to the show, log on to http://www.facebook.com/Inzpire.ME or email at enquiry2.me@hotmail.com . "F.Y.I On Stage with Eric Nam" is an exclusively event by M.E Malaysia. It is supported by KLIK Magazine, MyKpopHuntress, Kpopped.com (Official Media Partners), KakaoTalk (Official Chat Application) and special thanks to Klang Parade (Official Shopping Mall).